Dear job seeker it is golden opportunity to get government job in 2017. With reference to announcement made by transport minister of Maharashtra that MSRTC going to recruit for huge number of vacancies. Detail advertisement for it will be publish soon. From internal sources it is conformed that this recruitment will be for 14247 vacancies for various posts such as driver, conductor, assistant, clerk, supervisor. it is golden opportunity for those who want government job in Maharashtra. Candidate must be 12th pass from recognized board. Age of Candidate must be between 21-35. Candidate should have good knowledge of MARATHI Language. Driving license not compulsory for other posts. 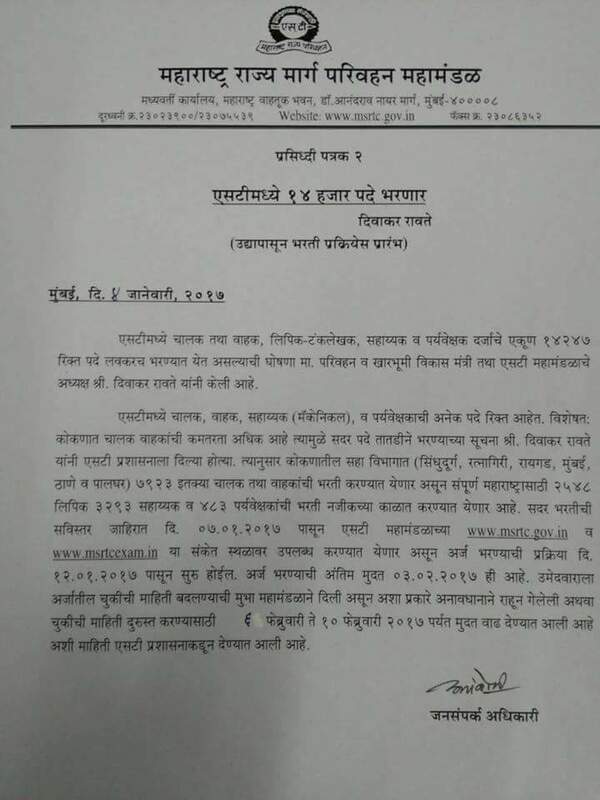 For selection candidate must pass exam and interview conduct msrtc. go to msrtc website msrtc.gov.in . Then follow instructions given in notification.